People talk about retirement like it’s supposed to be an endless vacation. But what if, like the majority of those facing retirement, you can’t afford such a luxury? Or, what if you just want something more from retirement? Some advocate for no retirement at all. But you’ve worked for decades and a rest and reprieve do sound appealing. What should you do? Does God have a purpose for your retirement? Planning retirement doesn’t have to be distressing. Retire in a way that’s God-honoring, purpose-filled, restful, and truly biblical. The 55 age and over population is the fastest growing in America as the Baby Boomers are entering retirement age. This book is a good guide for Christians who want to make the most of this next phase of their lives. Haanan suggests that many people may want take a sabbatical for a few months at the beginning of retirement to ask "God, what are you calling me to do in retirement?". He encourages the reader to look at their family, financial, and geographic circumstances. He also urges readers to look at the gifts and abilities, as well as where God might be calling them to participate in His work in the world. 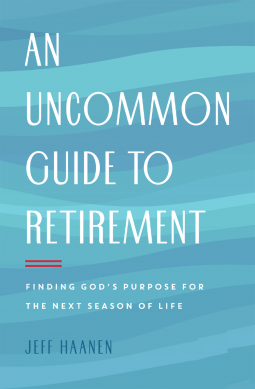 Reading and reflecting on this book will enable the reader to enter retirement and "pause and ask deeper questions about the next stage of life. How will I spend my days? What is God calling me to? What will people say about me when I'm gone? What dreams will I dream over the next generation?" I recommend this book to any individuals entering retirement who are uncertain of their path forward. All quotes are from An Uncommon Guide to Retirement, by Jeff Haanen. I received a complementary copy of this book from the publisher through  NetGalley . A good read, however, I found it repetitive in many places and not as enlightening as I had hoped. I did find some very interesting thoughts/suggestions to reflect on. I also enjoyed the "Common vs Uncommon" perspectives at the end of each chapter.